Totally edible, gorgeous works of art. My perfect sugar cookies are topped with a sweet canvas of icing and hand painted with watercolor made of food coloring and finished with a splatter of shiny edible gold. This probably the most fun I've ever had decorating cookies. 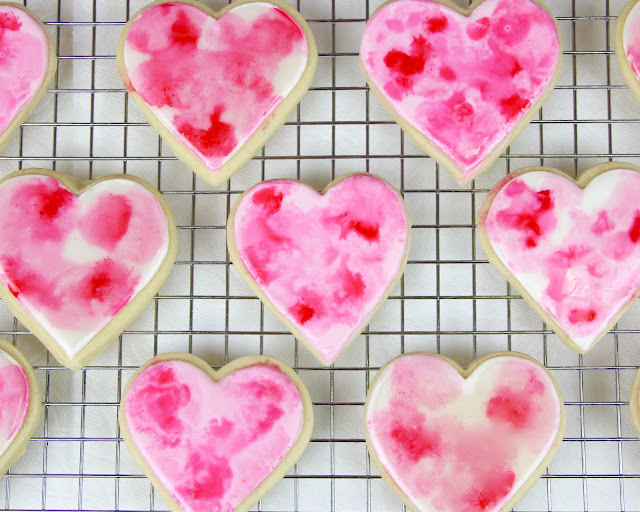 This technique is so easy to do, you don't have to know any fancy piping techniques, and they come out super artsy and sophisticated. What I love is that this is literally an edible art project. 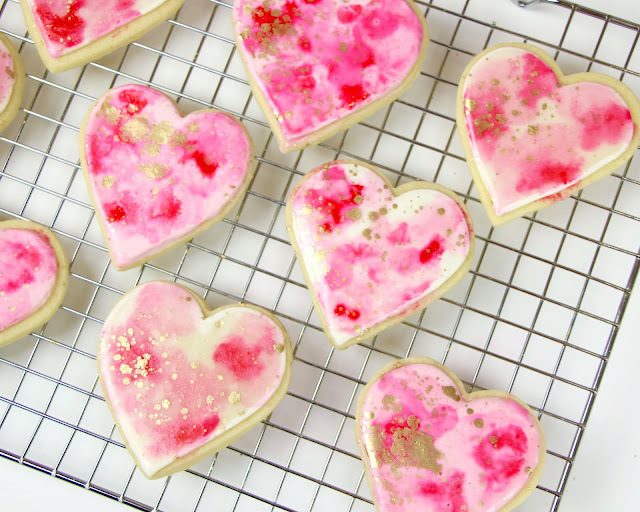 These cookies come out really impressive, they look like a fancy gourmet confection, but they don't need to be super perfect, they each have their own unique look to them, and no two cookies come out alike, so you can really just have fun with it and paint away. We're using my go-to vanilla sugar cookie recipe for perfect, thick cut-out cookies that don't spread and loose their shape when you bake them. 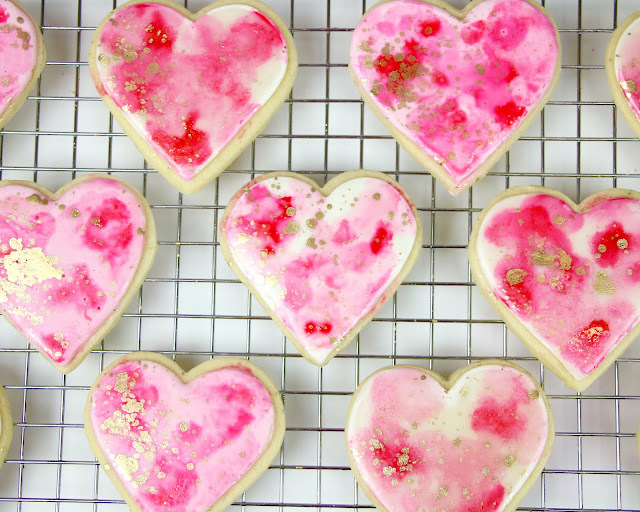 They're soft and tender with a little bit of crunch around the edges and make the perfect canvas for decorating, with my easy hard-drying cookie icing, but you can also do this on store bought cookies and cookie icing from the grocery store too if you want an easy alternative. Just make sure you're getting the hard drying cookie icing, so you can paint on top of it. 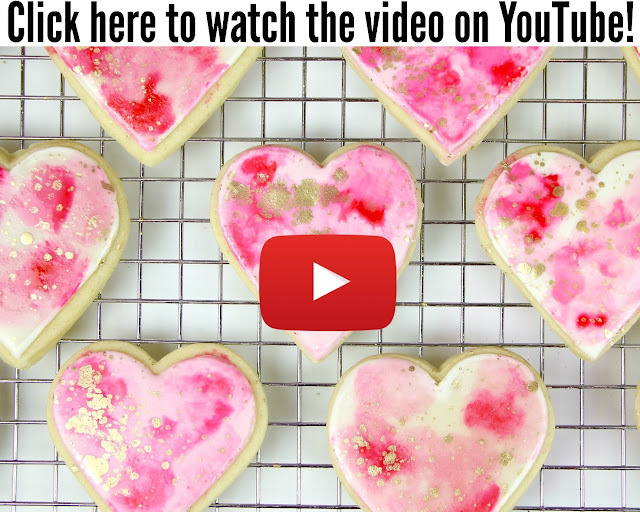 I have a whole video on my best-ever cut-out cookies, so you can check that out if you want more step-by-step details on the baking process, but I'll give you a quick run-through of the recipe before we start decorating. The edible paint is made out of food coloring, so it's 100% edible, and you can really use any color you like. 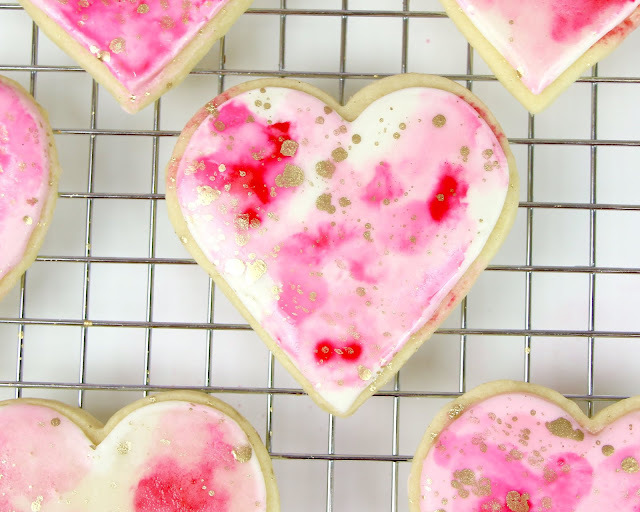 I chose pink, but you can do all the colors of the rainbow if you like so you can really get creative with these and make them for just about any holiday or occasion. 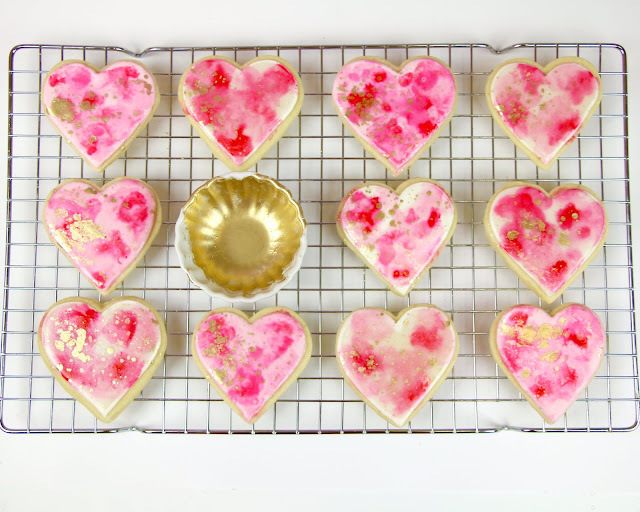 To make these extra fancy, I'm going to show you how to make edible gold paint to splatter on top for a really special elegant touch. 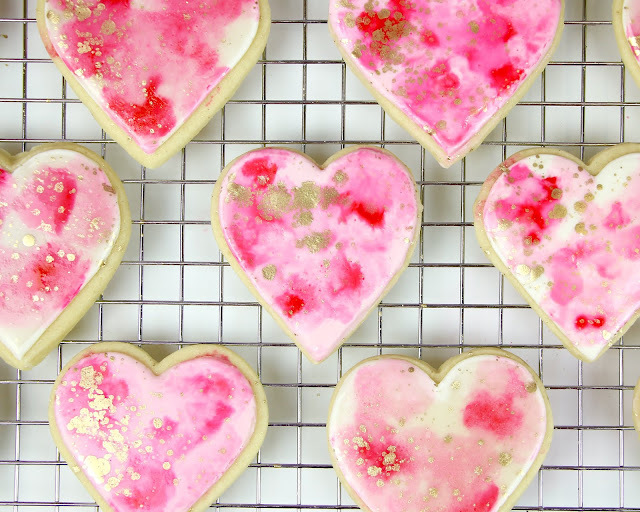 What's great about these, is the baked cookies freeze wonderfully so you can make ahead of time, too, and then decorate them when you're ready. 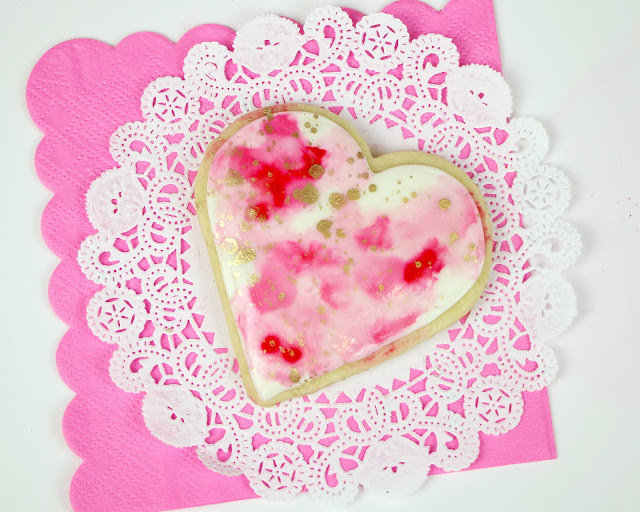 So these make a really fun activity for kids, if you want to let them decorate their own cookies for a special treat, or for a special girls night in. 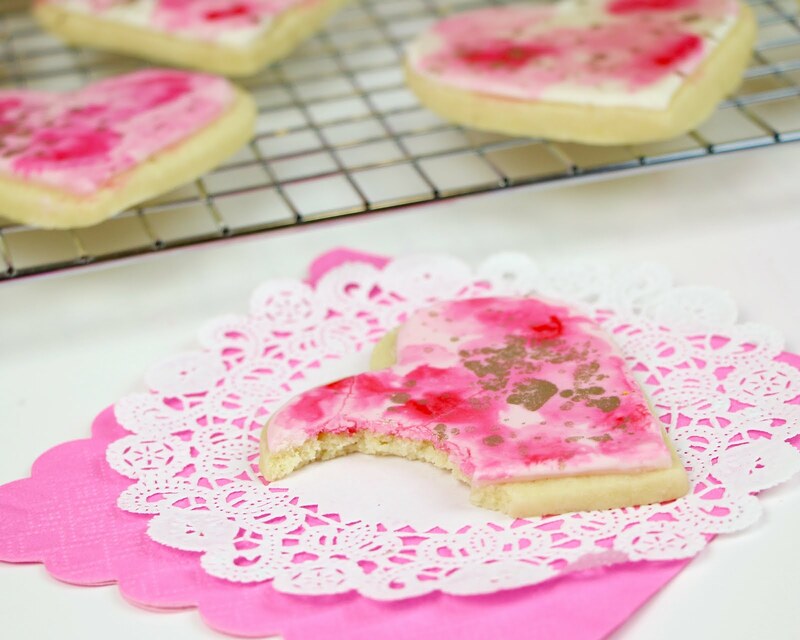 You can swap out the shapes and make any kind of edible art you can think of. When ready to bake, remove dough from fridge. 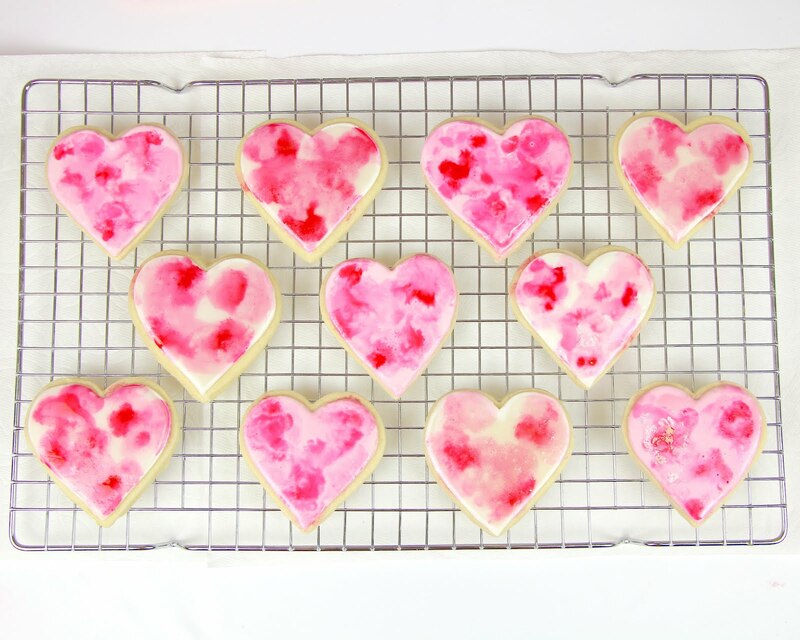 Preheat oven to 350 degrees F. Cut out shapes with a cookie cutter and transfer to a parchment or silicone lined baking sheet. 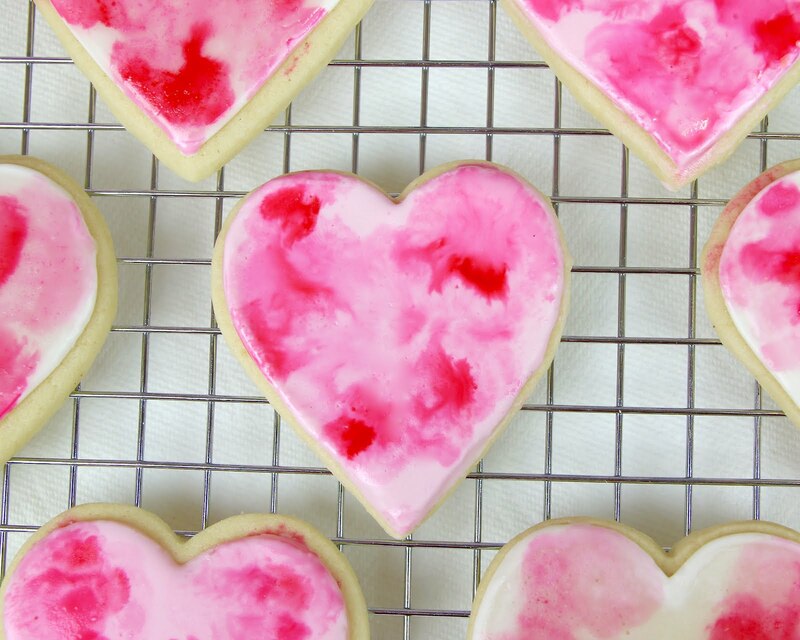 Chill in the freezer for 10 minutes to firm up, so cookies hold their shape better while baking. Bake for 8-10 minutes, depending on size. Re-roll the remaining dough and continue cutting until all dough is used. 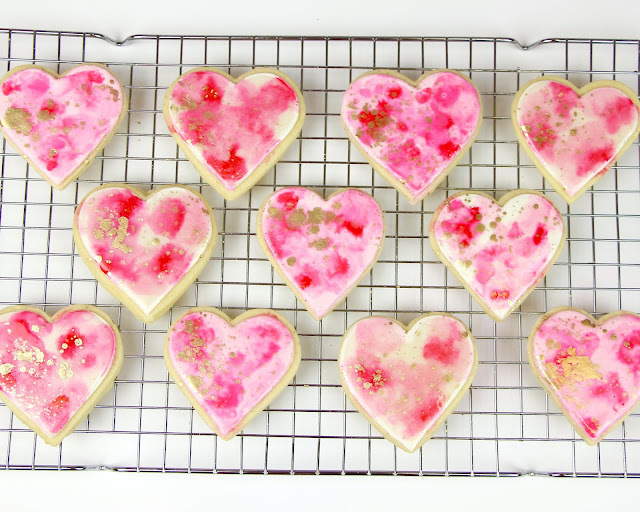 Cool on baking sheet for 10 minutes before transferring to a wire rack to cool completely. Store in an air tight container until ready to decorate (Up to a week at room temp, or frozen for a few months). Whisk together all ingredients until smooth and thick. Transfer to a plastic ziploc bag and press out any air. Snip off a tiny piece of the corner of the bag and pipe an outline of onto the tops of cooled cookies. 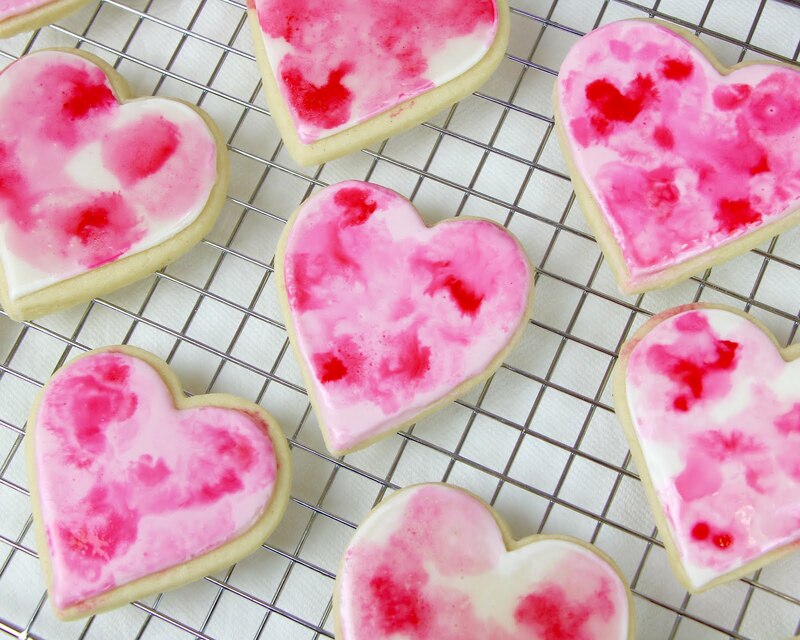 Once dry, add an additional teaspoon of milk or water to the icing bag to thin it out and flood the rest of cookie in with icing. Let cookies dry completely, usually overnight, before painting. Place a few drops of food coloring in a small bowl, for a more vibrant darker shade. In another bowl, dilute one or two drops of food coloring with a splash of clear vanilla extract or water, to create a lighter shade. The more extract you use, the lighter the color will be. Use a food-safe paintbrush to paint onto the cookies, letting the colors mix and blend. 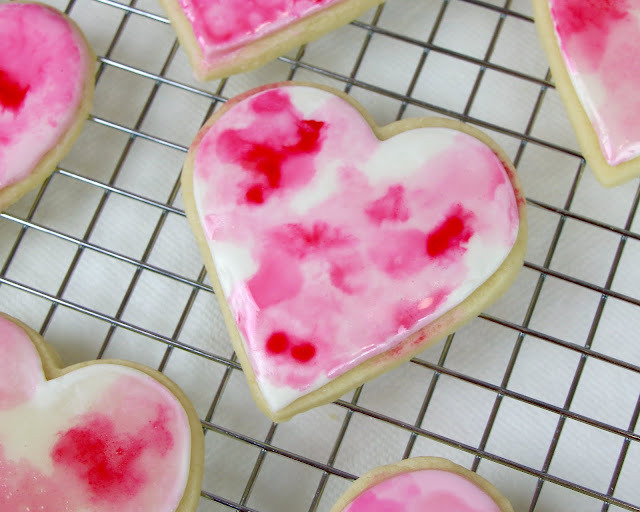 Add a dab of water to wash out and blend colors for a watercolor effect, making sure not to oversaturate the cookie with too much liquid, so the icing doesn't start to melt. Press a piece pf paper towel on top to soak up any extra liquid or excess color, if needed. Let dry completely. 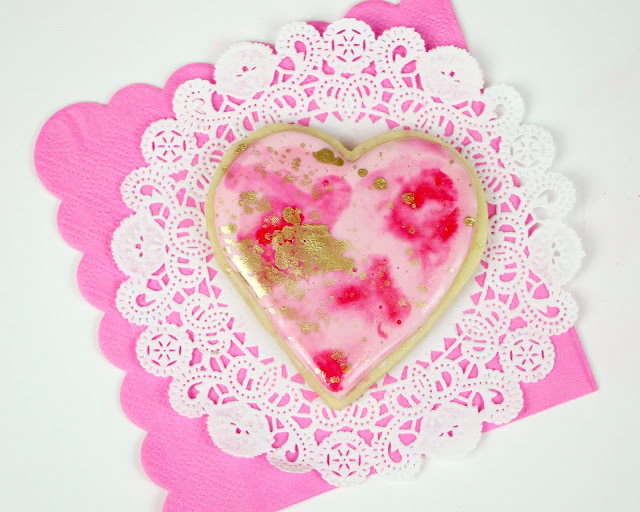 To create gold splatter, mix together a few drops of clear vanilla extract with a about 1/2 teaspoon of edible gold dust to create a smooth liquid, the consistency of paint. If you add too much liquid, you will get splotches and the color will not be as vibrant. 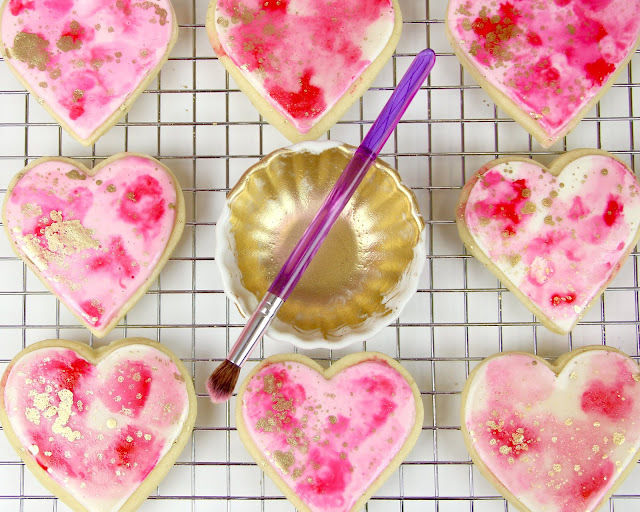 Dip paint brush into the bowl and gently tap the brush with your other hand, so the edible gold paint drips and splatters on top of the cookies. The gold dusts tends to settle at the bottom of the bowl, so make sure to keep stirring it up from the bottom before each dip of the brush. 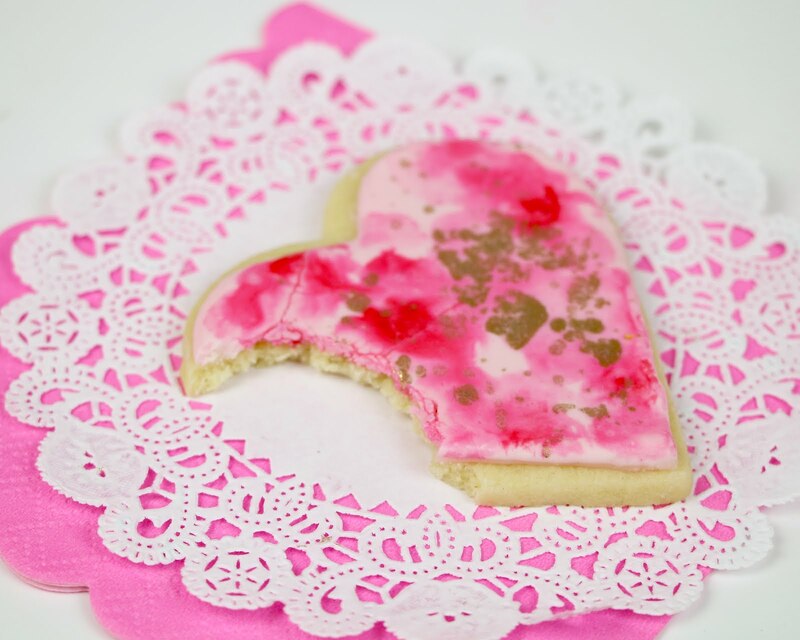 (Tip: place a few paper towels under the cookies so the splatter doesn't get on your work surface.) 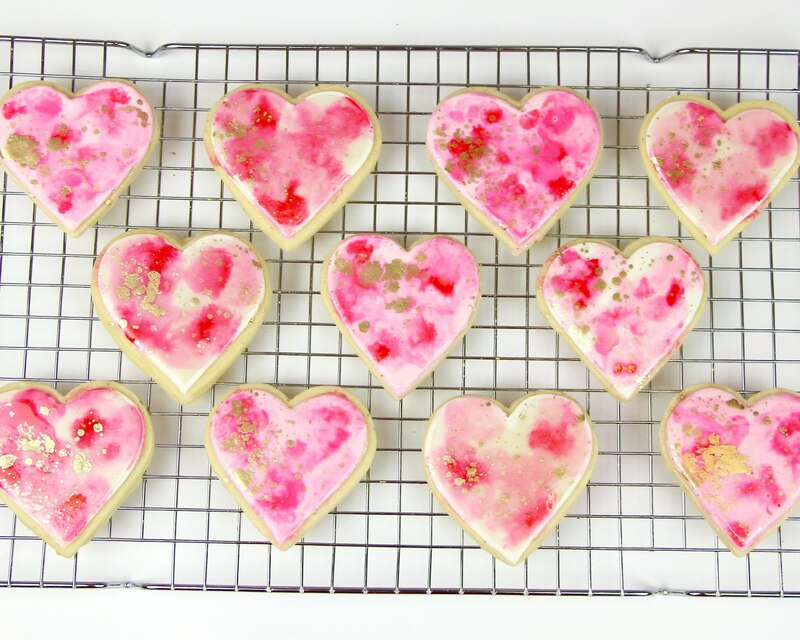 Let cookies dry completely before stacking or packaging.